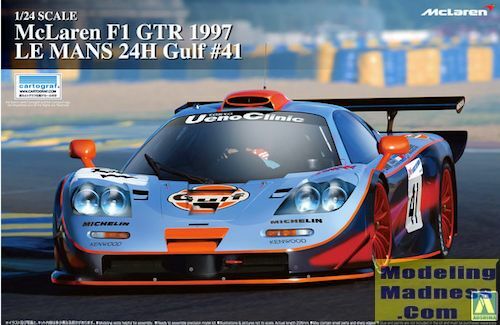 The McLaren F1 GTR was a racing variant of the McLaren F1 sports car first produced in 1995 for grand touring style racing, such as the BPR Global GT Series, FIA GT Championship, JGTC, and British GT Championship. It is most famous for its overall victory at the 1995 24 Hours of Le Mans where it beat out faster purpose-built prototypes. McLaren F1 GTRs raced internationally until 2005 when the final race chassis was retired. A total of 28 cars were built during a three year period from 1995-97. This particular car is chassis #20 and finished second in the 1997 Le Mans 24 hour race. Aoshima has earned a deserved reputation over the last decade or so of providing high quality kits and this new McLaren F1 GTR is no exception. This is no curbside and you get a full engine to display. The sprues are, for the most part, individually packaged and are in various colors including light blue, black, chrome, aluminum, clear red, clear orange and clear for the windows. The molding is top notch without any visible molding glitches or flash, but you knew that already. The build of the car starts with a full front suspension and the assembling of the car's engine. The suspension fits onto the chassis pan and the engine along with the cooling system and the rear suspension upper section fit into a separate engine housing. This housing includes the upper wheel wells, part of the rear chassis diffuser and the firewall. Nicely done vinyl/rubber tires are included and there are decals for the Michelin logos. The wheels will need to be painted the appropriate shade and these are held onto the axle stubs by polycaps. Both front and rear suspension members have disc brake assemblies. One does not assemble the intakes or second part of the exhaust until the engine is in the motor housing. This assembly then fits onto the back of the chassis pan. There is a very complete interior and this includes a nicely done roll bar, racing wheel, seats and separate pedals. Decals are provided for the instruments. It would have been nice to have a racing harness decal, but many modelers will go with an aftermarket set. The upper body is a separate piece and molded in Gulf Blue along with the engine covers and doors. It would be a good ideal to paint the body before attaching all the zillions of bits and then repainting it to touch up areas. The kit includes a full set of window masks that also include a set for the headlight covers. Racing car engine covers are not hinged and that goes for this one as well. It appears that the separate doors can be posed open. There are a lot of smaller bits to attach to the body on this one so that will keep you busy for a while. A set of air jacks are included in case you wish to pose your car on these jacks. 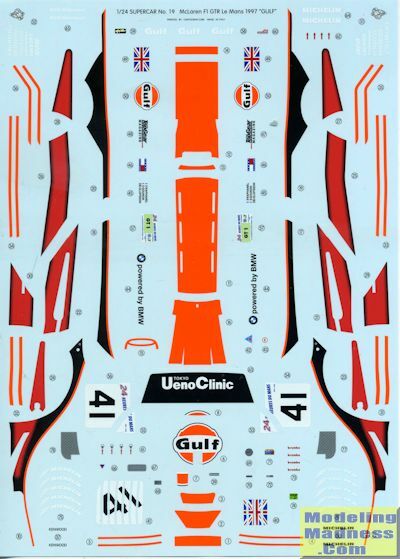 Markings are provided for the box art car and the sheet is quite large. Some pre-painting will be required as the black along the lower sides and front is not a decal. The decals are superbly printed by Cartograf so you know you are getting the best. 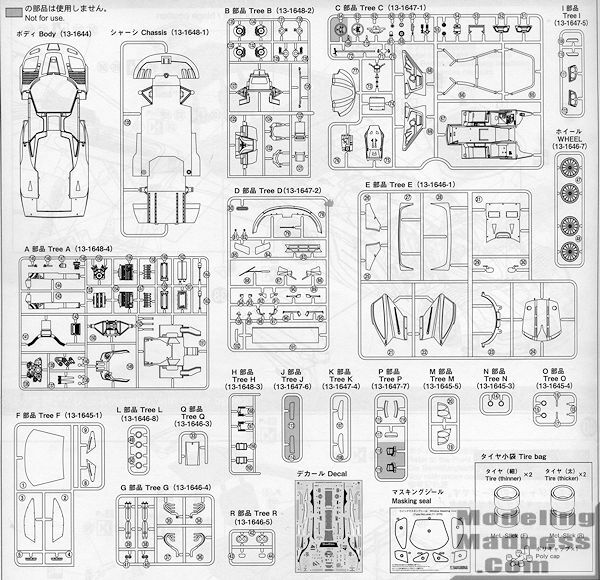 Instructions are superbly done and consist of 40 well drawn construction steps. There is painting information provided throughout the build using Gunze paint references. Some paint mixing will be required to get some of the shades. If you are a fan of modern GT racing cars and have the skills needed to build a kit like this, then this one is very much for you. The number of small parts and the complexity of the decals and painting scheme make this unsuitable for a beginner, but any intermediate modeler should be able to handle it. The result will be a very impressive replica. Thanks to www.hlj.com for the preview kit. Get yours on discount at this link.